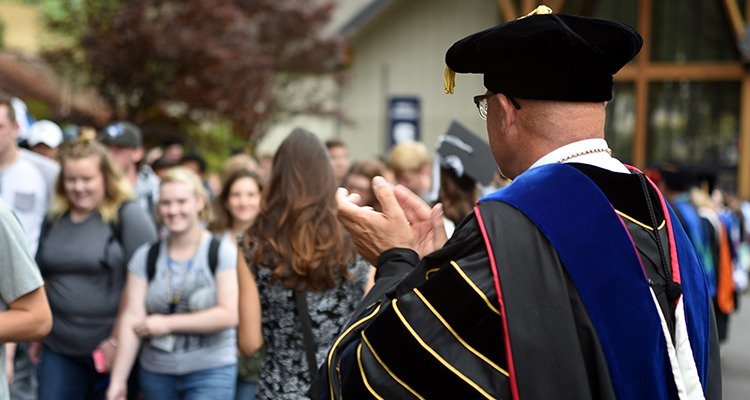 The 2018-19 academic year began with fanfare at Corban University, where students gathered for the traditional Convocation ceremony. Students made their way across the cool, sunny campus to the sound of shofars, trumpet-like instruments made from rams’ horns. Used in ancient Israel to call the camp together, shofars have become an important part of Corban’s Convocation celebration, as they’re used to call students and faculty together while symbolizing Corban’s Judeo-Christian heritage. Extra seats had been added to the Psalm Center floor to accommodate the largest crowd the Psalm Center sees each year. Freshmen, sophomores, juniors, and seniors filed into their respective sections, and chatter died to a hum as the lights dimmed. In unison, students began clapping as they anticipated the procession making its way toward the Psalm Center: Corban faculty, adorned in their academic regalia, accompanied by the majestic whine of bagpipes. Leading the procession was Dr. Jim Hills, senior-most faculty member, bearing the University Mace, a handcrafted wooden scepter ornamented with a golden eagle and open Bible. Faculty made their entrance, exchanging quick smiles and handshakes with the students on the aisles as they proceeded to the stage, where they’d be seated for the remainder of the ceremony. This was the first of two occasions on which they’d be wearing their regalia—the second being Commencement. As he welcomed the assembly, Dr. Sheldon Nord remarked that Convocation and Commencement provide “bookmarks to our academic experience.” The first introduces new students to the faculty who will shape, equip, and mentor them. The second allows faculty and graduating students to celebrate the journey they’ve been on together. After an opening prayer led by Provost Mike Patterson, Corban’s ASB President Morgan Schmidt took the stage to address the student body. After being led in worship by Will Parker on the ukulele, students listened to Aric Wood, ASB Vice President, as he prepared them for the most crucial moment of Convocation: the pledges. “A pledge is a sacred agreement to a cause that has been set before you,” Aric explained. Each class took turns reciting a separate pledge, written just for them by Dr. Jim Hills. While seniors promised to enter their final year of education with courageousness, juniors promised to step into a new level of leadership, sophomores promised to encourage and support incoming students, and freshmen pledged to begin their academic journey with humility and gratitude. Finally, faculty pledged to serve students, and the institution, with faithfulness and humility. Lastly, each student was presented with a small gift—a keychain inscribed with the Corban seal and a symbol of the year’s theme—“Hunger and Thirst.” Dr. Nord encouraged students to keep the keychain where they would see it every day and use it as a reminder to pray for one another and continue to pursue their Corban education with excellence. Students were dismissed back into the sunshine, bright, full of energy, and eager to begin the next chapter of their college careers.